The Faculty ITC of the University of Twente has joined up with the Faculty of Engineering of the Universitas Gadjah Mada (UGM) and the commercial Indonesian LiDAR services provider PT ASI Pudjiastuti Geosurvey (PT. APG) to fly an airborne survey over areas with geothermal potential near Bajawa, Flores Island in East Nusa Tenggara Province of Indonesia. The main goal of the survey is to acquire for the first time in Indonesia a combined airborne dataset of high precision LiDAR terrain data with surface temperature data to map surface expressions of the underlying geothermal potential. On 6 September 2018 during the Indonesia International Geothermal Conference and Exhibition (IIGCE) in Jakarta, representatives of the three parties signed a collaboration agreement witnessed by representatives of the Embassy of the Kingdom of the Netherlands and the coordinators of the Geothermal Capacity Development Programme Indonesia – Netherlands (GEOCAP). The survey is jointly funded by PT. APG and by GEOCAP. 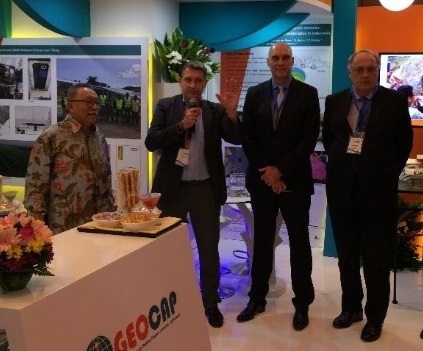 GEOCAP is an international collaboration between Indonesian and Dutch entities with the goal to develop intimately linked geothermal programmes for education and training, research and subsurface databases. It is funded by the Dutch Ministry of Foreign Affairs.